Barack Obama’s last nine months in office will provide plenty of opportunity for him to spoon feed his scribes in the corporate media. Under the pretense of writing history they will serve as one collective pro-Obama mouthpiece between now and January 20, 2017. The process is a delicate one however. The president will also have to explain those policies that did not produce the outcomes he wanted. Such is the case with any discussion of his role in destroying Libya. It seems strange that he would want to remind people of the disaster of his own making but there is a twisted logic. He is not only defending himself but trying to give Hillary Clinton cover in her presidential campaign. Hillary haters ought to be Obama haters too but most Democrats won’t tear themselves away from their idol. The openly and gracelessly evil Hillary takes the fall for a plot hatched by both of them. It is just one of the reasons she is damaged goods to millions of Democrats who have chosen to support Bernie Sanders instead. 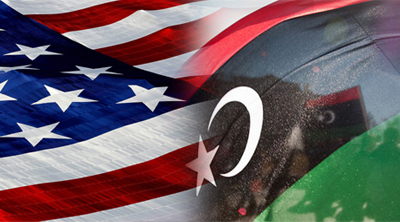 The United States, NATO and Gulf monarchy actions against Libya in 2011 were a war crime by any definition of the term. An unknown number of people died, the aggression instigated a massacre against dark skinned Libyans and immigrants from African countries. Entire cities like Tawergha were turned to rubble by America’s jihadists allies who are otherwise known as terrorists. President Muammar Gaddafi was murdered by a mob who were only able to carry out the deed with western financial and military support. The attack by the United States and its allies resulted in a devastated nation that to this day is racked by political and sectarian violence. Libya has no functioning government and became a haven for ISIS. ISIS is strongest in Iraq, Libya and Syria, all of which were targets of regime change. Thanks to Barack and Hillary, Libya is also a route for desperate people whose plight was created by U.S. interventions. Refugees from Syria, another country devastated by America, take circuitous paths to Libya in hopes of getting to Europe. It is also a point of embarkation for Africans. Some of those falsely claim to be from Eritrea, a country under American attack by sanctions and other non-military means. America makes Eritrea unlivable and forces its citizens to immigrate. They and others then get a place at the head of the refugee line that wouldn’t exist if the United States would stop waging wars. American and European terror was a gift that kept on giving. The weapons seized from the Libyan army were used by al Qaeda affiliates in Mali and in Nigeria. Boko Haram’s strength and ability to terrorize Nigerians is the direct result of the Libyan crime. Hillary Clinton is quite rightly taking heat for being the U.S. mastermind of this atrocity. As secretary of state she made the case for the American nightmare. She was quite proud of this evil achievement and infamously said, “We came, we saw, he died.” Of course these machinations were the cause of blowback in 2012 when jihadists killed the American ambassador at Benghazi. All of this criminality is sent straight down the memory hole with the help of the corporate media. As part of his never ending marketing and propaganda drive Obama graces the cover of the April 2016 issue of The Atlantic magazine with an article entitled, “The Obama Doctrine.” Presidents don’t give access without an expectation of looking good. The interviews with the president and current and past administration officials doesn’t deviate from this rule. Most Americans still believe in Manifest Destiny, the belief that their country has a right to do what it wants in the world. They don’t really care about invasions and interventions as long as they can be considered successful. That means no dead Americans and countries that are controlled by chosen puppets who seem to keep their nations under control and out of the news. Hillary Clinton is the villain in the story because of her cackling celebration of Gaddafi’s murder and because Libya continues in a state of crisis. There has been very little questioning of the idea that the United States has a right to decide who runs that country or any other. Imperialism is still acceptable if it is carried out seamlessly. It is only the mess that makes Americans uncomfortable, and Democrats are no different from Republicans in this regard. If there was any justice in the world Barack and Hillary would fear being on trial. Instead he leaves office looking like a model on magazine covers and they work together to make sure that she sits in the oval office after him. But there isn’t enough justice in the world and they will work hand in hand like the political twins they have always been.